Decided to have another night out with a chair, binoculars and naked eye. Sky was nicely dark when I went out, the Milky Way was very obvious overhead. Some haze about in parts of the sky. Temperature was reasonably warm. Saw a satellite in Cygnus. Moved roughly South to North along and more or less parallel with the "body stars" of the Swan. First saw it in binocular while doing a general sweep of the Milky Way and then followed it with naked eye. Was easy to see and reasonably bright. I wouldn't have put it any brighter than any of the "body stars" but I wouldn't have put it much fainter than the faintest of them. Tried to see M71 in Sagitta with binocular. I think I could see it. In the correct location I got the vague impression of a faint misty patch, quite small, and only noticeable with averted vision. Seems like a good candidate to hunt down with the telescope. By pure chance, while sweeping the area around Sagitta and Vulpecula, I stumbled upon The Coathanger. I was aware of this asterism from books but hadn't recently taken note of its location was it was a delightful surprise to stumble on it by accident. While it does sound terribly obvious it really does look like a Coathanger. Having located it once I was very easy to locate it again in the binocular. It really is a nice sight in the binocular. At 21:45 UT, while looking at it in the binocular, a meteor went right through the middle of the field of view. Finished off by making a rough sketch. 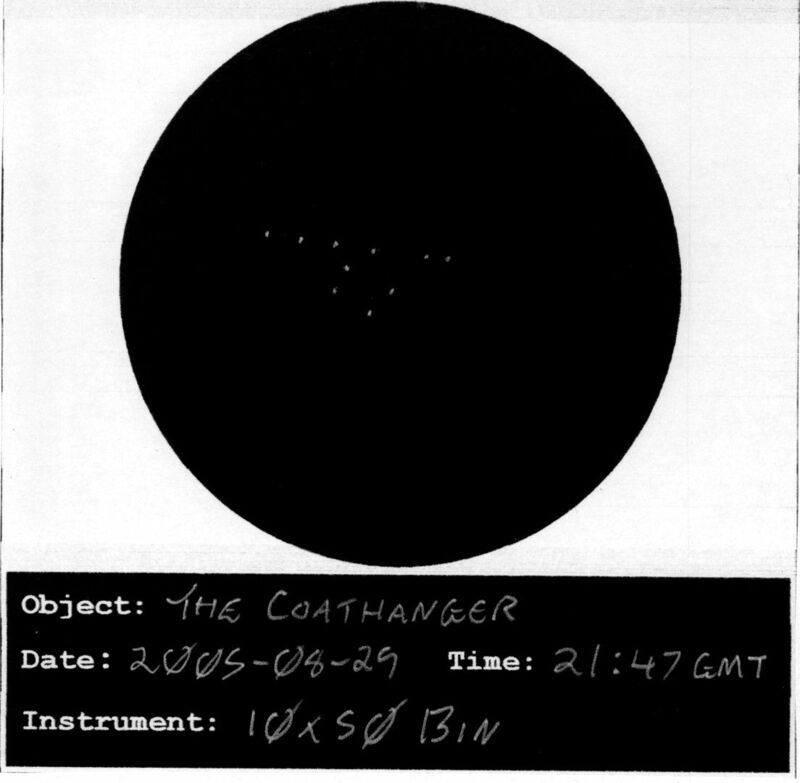 Note that all I did was try and draw the stars of the Coathanger itself, I didn't bother to try and draw any of the other stars in the field. Had a quick glance at M13. It appeared to be stunningly bright tonight. I wanted to make a sketch of it as it appears in the binocular but, as I was getting the drawing gear together, some cloud moved into the area making it less obvious. Decided to leave the sketch for another night. Went hunting for and found M39 in Cygnus. Very obvious grouping of stars. Easy to find thanks to four stars, more or less in a line, close by. Best description I can give is that it looks like a loose collection of stars in a roughly triangular shape. First noticed a "fuzzy patch" in the sky between Cassiopeia and Perseus with the naked eye. Check on charts what's there and realised that it's the double cluster of NGC 869 and NGC 884 in Perseus (also known as Caldwell 14). Had a look with binocular. Excellent sight. The best description I can think of is that it's two star-rich groups of stars, close together, and made more spectacular by being in a pretty star-rich field anyway. Also noticed a really nice arc of stars heading away (roughly North I think) from the pair. By now more cloud was forming and rolling in. Decided to pack up. Just as I was packing up I noticed that Mars had risen some way above the houses to the East of me. Very bright and an obvious red tint to it. Nice to see that it's rising earlier and earlier. Just a couple of weeks back I didn't notice it until around 22:55 UT. It's starting to get to the point where there's no excuse for not getting the 'scope out and starting to observe it.